Providing a national directory of Bail Enforcement, Fugitive Apprehension, Bail Bondsman, Bounty Hunters, Fugitive Recovery, Private Investigators and Skip Tracer Professionals located through out the United States. This directory is provided as a service to the industry as a form of networking and to the public as a method to locate an agency in your area. All entries are submitted by individuals. 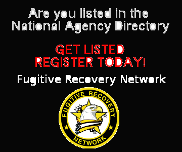 Being listed in the directory does not imply endorsement by Fugitive Recovery Network. Your State not listed? Then no one has submitted a listing - Add your company today!